Calgary Olympic Oval | Where do YOU Skate? What's so important about the Calgary Olympic Oval skating facility? The University of Calgary and its part in the Winter of 1988 Calgary Olympic Games, for starters. 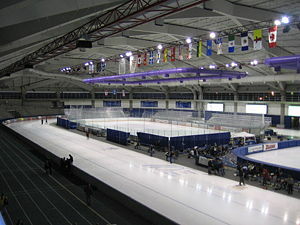 It remains a first class speed skating facility serving Alberta and all of western Canada. Seems this stucture was a triumph in 1980's sports development anywhere in the world. It was, at least, a technological victory. How did this surface become known as the fastest ice on earth? You need only examine the list of speed records set here. Is it because of Calgary's high elevation? One can only guess. So where is the Olympic Oval? It's not within the Calgary Olympic Park on the city's west side, as a visitor might imagine. COP is designed for downhill events such as ski-jumping and luge, while other olympic skiing was held at nearby Nakiska and Canmore. And, somehow, unusually warm weather did not hinder these events too badly. So much for downhill. Flat elevation 1988 Winter Olympics events were held at the Oval. To get to it, head for the University of Calgary campus. The Oval is just northwest of the red star. This U is also home to the Calgary Olympic Village, the athletes' temporary residences, now being used as college dorms. If you go downtown, you'll find the Calgary Olympic Plaza. It features fountains and very natural but urban scenery in the summertime with ice skating in winter. It's nowhere near as big as The Oval, though. Its main purpose during the 1988 Olympics was for ceremonies and formal events, and the downtown location was ideal for that type of celebrating. There was a lot of olympic spirit in town that year. A big party y'all. Not too far from the Plaza is the Olympic Saddledome, now known as the Pengrowth Saddledome. They used it for skating events as well, figure skating and Olympic hockey. They built it southeast of the downtown map at the Calgary Stampede grounds and it still hosts the NHL franchise - Calgary Flames to this day. All of this infrastructure, including the Oval, was built for the 1998 Calgary Olympics, the XV Olympic Winter Games. It lives on in this expanding city, and shall remain a legacy for future generations. Go back from Calgary Olympic Oval to the Calgary Downtown Map webpage.